A place for me (Kimmy) to tell the world (or, rather, the portion of the world that might check out my blog from time to time) about some of the stuff I like. Stuff Kimmy Likes: The Store! There's "Stuff Kimmy Likes," and then there's "Stuff That Makes Kimmy REALLY Happy." This post is about one of the most consistent Happy-Makers in my life: Zoya Nail Polish. Obviously, I haven't blogged in forever, give or take a couple of lifetimes, thanks to my uncooperative brain (which has Chronic Daily Migraine) and having been going through a very long, drawn-out, nasty divorce, but I just got word last week that I am OFFICIALLY and finally divorced, which I do like, and does make me very happy, thus, the mention here, on a blog where I write about things I like. Hopefully, I will feel like blogging more, now that the stress of that is behind me-- we shall see. But anyway, Zoya. Pretty much everybody who knows me knows that I love Zoya. I mean, I luuuuurve Zoya, and I recommend it to everybody. And not just because I prefer the formula (super-smooth, with no fumes! ), or that each collection is more beautifully dazzling than the one before (um, PIXIE DUST), or that they're always coming up with some new, smart way to engage their customers (hi, color spoons). And not even, well, because of this. The biggest reason, no joke, is the people behind the brand. The people that have developed a loyal, cult-like Zoya following in some really simple ways. First, they created a superior product, of course. But, more importantly, in my book, is that they ENGAGE THEIR CUSTOMERS better than any company I know. (And I'm kind of a marketing junkie, I admit. I pay close attention to this stuff-- especially when it comes to Marketing to Women. Some would even call it "obsessed," which is fine-- I just really like when Marketing to Women is done right!) Zoya does it really right. On Twitter. On Facebook. Go look-- follow them! They create community around their product. They respond to people, they goof off with them, they share their excitement. THAT is probably the key-- they engage like they are excited to do it. And they're not afraid to show they're having fun-- just check out my favorite of their YouTube videos, if you want to see what I mean. That kind of stuff makes me really happy. and all-caps-holler "RUN RIGHT NOW AND SNAG THESE CUTE LITTLE TINY BOTTLES WHILE YOU CAN," because, my gosh, they are so cute and teeny-tiny! But what I really want you to do is pay attention to how your favorite brands interact with you. Then, compare those things to what Zoya does to keep their products interesting, and the many unique ways in which they genuinely engage and include their customers in what they're doing. I'd be willing to bet that, at the very least, nobody will seem to have more fun doing it. Thanks, Zoya Fairies, for making me happy, particularly, through some very difficult times. With your polish, with your delight, with your creative innovation, and your genuine interest in interacting with your customers, fans, and followers, y'all rock. Product samples have been sent to me for consideration by PR. I love the idea of color spoons- excellent! I have issues surrounding discerning color and I think these are brilliant! Bop, I totally agree! And, even better, the amount you spend on the spoons goes towards your next order! 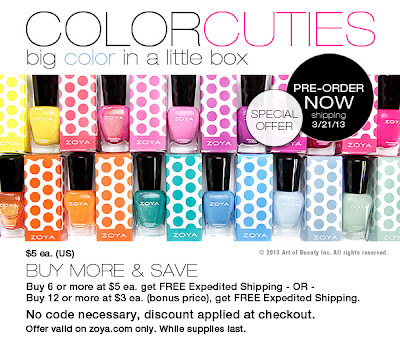 Color Spoons ship for free and the cost of the color spoons is added as a coupon towards your next purchase of Zoya Nail Polish or any (non-color spoon) item on our site. Coupons are generated once your order ships and can be found in the "My Account" section of the website under the "My Coupons & Promo Codes"
Sister, I just went to order all 12 of those precious ones and THEY ARE SOLD OUT!! CRAP!! You can get in touch with me at StuffKimmyLikes[AT]gmail[DOT]com. I like/am addicted to pinterest. I like sharing opportunities to save. I like getting $$ back. I like being an Amazon Associate. I like stuff that you might like, too. I like reading these blogs. I like my old blogs. I like to design stuff.